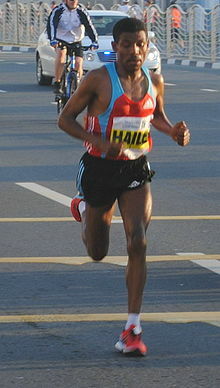 For those of you that don’t already know, my running hero is the Ethiopian runner Haile Gebreselassie. He has inspired me in a number of ways; his sheer determination, his achievements and his continuous commitment to helping his country. Haile has bounced back from so many lows in terms of when he has had injuries and when he hasn’t done so well in races and he has achieved so many world records for his running such as holding the world record marathon time of 2 hrs 3 mins when he ran the Berlin Marathon in 2008. The thing that I really admire about Haile though is when many athletes that live in poor countries become famous the first thing a lot of them do is to move to the US or to wealthier countries – often this is because of facilities available and other times simply because they can. Haile on the other hand has stuck by his mother country Ethiopia and continues to run businesses, employ local people in order to support and help his country and for me I find that truly admirable. I have read his book a number of time and I would recommend it to anyone interested in running and knowing more about what makes elite runners tick. Anyway yesterday Haile won the Great Manchester Run in the UK for the second year in a row. His time was 28 minutes 10 seconds!! Amazing!